Koolen Fine Arts handles paintings by The Group of Seven. Born in Sheffield, England, by the age of nine he was doing sketches and drawing cartoons. At age of thirteen he won a scholarship to study nights at the Sheffield School of Art. In 1911 he came to Toronto to work as an engraver, his fellow employees included Tom Thomson and Frank Johnston. It was through these men that he developed his interested in painting the Canadian landscape. In the summer of 1916 he was commissioned to paint the activities of the Canadian armed forces around Halifax, he also did many other paintings and drawings while there. In 1919 he moved back to Toronto to become vice-principal of the Ontario School of Art. Lismer and other artists associated with the Group of Seven made numerous trips to the northern sections of Ontario where he created some of his best known works. He would make sketches, and during the winters in Toronto did most of his painting. His works have been collected throughout the world and can also be viewed in the National Gallery of Canada. Born in Toronto, he studied painting under William Cruikshank and G.A. Reid at the Ontario School of Art. Later attended the Pennsylvania Academy of Fine Art. During the first World War he produced over seventy works. After the war he made several trips to Northern Ontario and in 1920 he became one of the founding members of the Group of Seven, bur only stayed as a member for two years. This was mainly due to his desire to paint the Canadian wilderness in a less controversial style. He established a summer art school at Georgian Bay in 1930 for ten years. After that he made yearly sojourns to the Arctic regions, painting Eskimos, trappers, miners and nature, in 35 to 40 below zero temperatures. The Saskatoon Art Centre, Art Gallery of Ontario and National Art Gallery of Canada are some of the public collectors of his works. Born in Toronto, he started art studies at Ryerson School and later at the Hamilton Technical School, the Ontario College of Art and then to The Toronto Central Technical School. 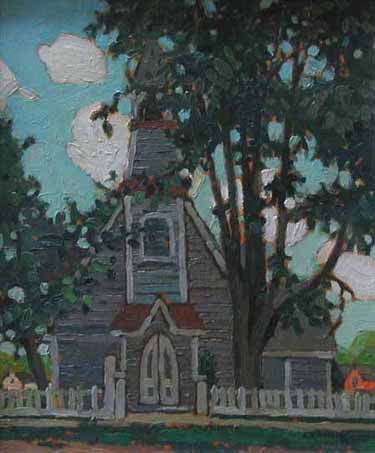 He painted with Franklin Carmichael for seven years and met the Group of Seven at the Arts and Letter Club. Casson, Carmichael and Brigden formed the Canadian Society of Painters in Watercolour in 1925, and this led to his becoming a member of the Group, replacing Franz Johnston. 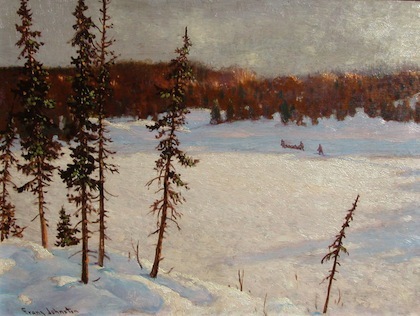 Most of his large canvases of the Haliburton and Lake Superior regions were done between 1926 an 1930. His style changed in 1944 when pattern became the vital element of his work. Perhaps some of Casson's attention to design was due to his growing interest in various types of reproductions of artists work. He has lectured on art to a number of centres in Ontario, and is represented at the Art Gallery of Ontario as well as most major galleries in Canada. Although Jackson wandered over much of Canada, Quebec villages were his most loved subject matter. As Naomi Jackson Groves writes, "A.Y. 's Quebec works have become so familiar to us Canadians in the course of this century that we usually simply take for granted that 'Quebec looked that way in the olden days,' forgetting that a thing only 'looks like' something after someone has created an image of it and made us familiar with that image." More than any other single Canadian artist during the quarter-century from 1920 on, it has been A.Y. Jackson who has created the image of rural.Quebec." For a brief history on The Group of Seven click here.